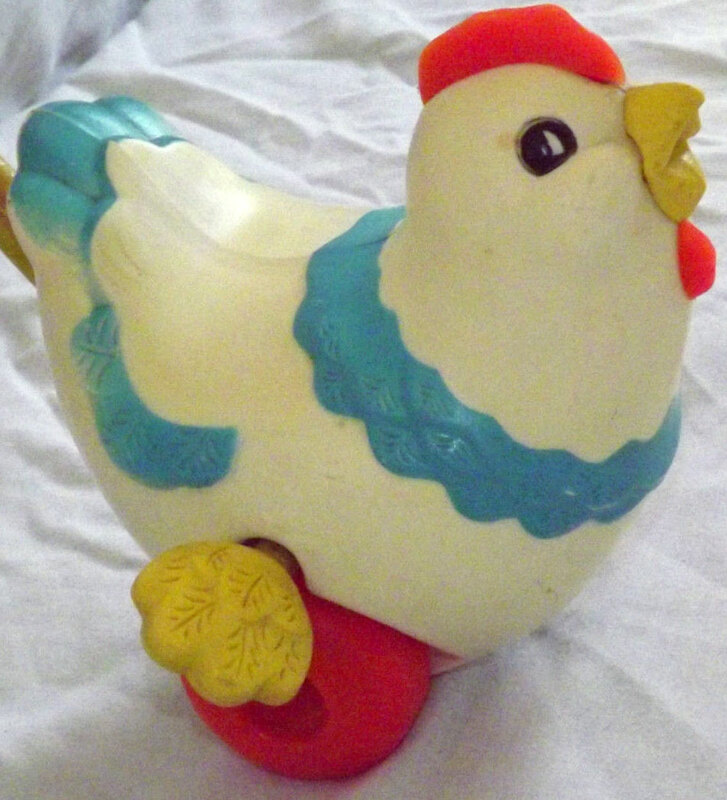 Description: Of all the push toys that Fisher-Price made, the Push Pullet is the only one that features a chicken. The chicken is sure to bring a bright smile with her realistic "cluck-cluck-squawk" voice and her twirling wings. Designed for children ages 1 to 3 years old. FPT1780 - White molded plastic chicken with yellow wings on the sides that twirl while the chicken makes a "cluck-cluck-squawk" when the toy is pushed. The chicken has aqua printed feathers around her neck and on the tip of her tail feathers. She has a yellow beak, red feathers on her head and a red beard. She rolls on 2 balloon-type plastic wheels has a hole on the end of her tail to attached the push stick. Measures 6-3/4" long, 7-1/4" high, and 8" wide. FPT4817 - Yellow 20" long push stick with red plastic ball on the end.